Alexander Trifonov is the International PR Rep for Gaijin Entertainemt, developers of megapopular MMO air combat game War Thunder. Andrew Stevens from Fanbolt.com recently spoke with Alex about the game and its future. As you all may know from my previous blog entry, I’ve been playing a lot of War Thunder lately and have been enjoying my time with it. So to offer up my first interview on Saitek, I decided to get a little more insight from Gaijin Entertainment in order to learn a little more about War Thunder and its future plans. I asked Alexander Trifonov, International PR for Gaijin Entertainment, some basic questions about War Thunder in which you can read below. Remember, if you have questions that you would like me to pass along to the War Thunder team, submit them to us on Facebook or Twitter and I’ll compile a list to have answered. Andrew Stevens (AS): War Thunder seems to have really taken off since its launch. How happy are you with the feedback you’ve received from the press and fans of the game? Alexander Trifonov (AT): We’re very happy about this – a lot of people are genuinely surprised to discover AAA-quality in a free-2-play game, and the amount of content that is available completely for free. AS: Do you feel with the mouse and keyboard set-up that you were able to attract a more unique audience than the normal flight combat game? AT: One of our goals from the beginning of development was to prove that flight simulation isn’t necessarily a niche genre and it’s possible to create the flight game accessible to everyone. Now we have almost 8 million players from all around the world – so it worked! 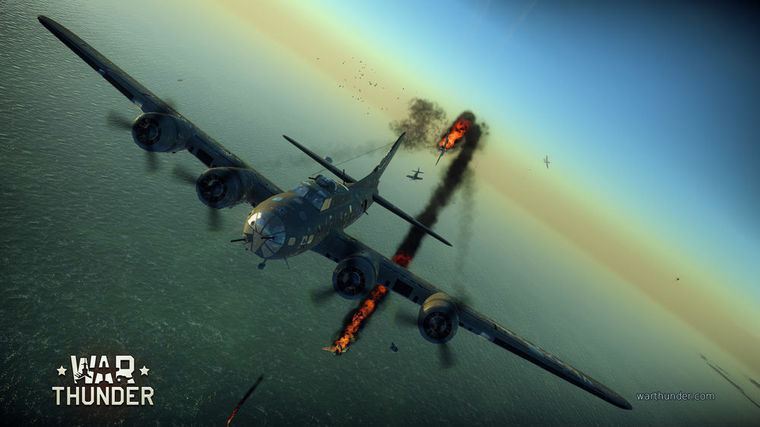 AS: What’s the future of War Thunder look like? How do you plan to advance the game and grow it throughout time? AT: We have 5 nations in the game (USSR, UK, USA, Germany and Japan), but only USSR and Germany have Ground Forces in addition to military planes. So, we have to add armored vehicles for other countries and maybe implement some new nations as well. And of course, there will be more new planes and vehicles for existing powers as well. Other additions will include new locations, features and game-modes like World War. AS: What type of contests do you plan on running in the future? What type of promotional campaigns can we expect? AT: We have a lot of planned marketing activities such as participation in gaming expos and other events like airshows, cooperation with different peripherals vendors, etc. We have good relations with flightsticks manufacturers and such, so expect to see a lot more activities. AS: I see that you are continually working on bringing more vehicles to the game. What ideas or concepts have you come up with that you haven’t began working on yet? AT: There were thousands of different types of military vehicles during WWII and early 50s (which War Thunder covers as well), so really, there’s always something more to add to the game. In the next major update for example we’re going to focus on jets mainly (especially Japanese ones), and also anti-air vehicles for the combined battles. AS: How happy have you been with the launch of War Thunder on the PlayStation 4? What type of feedback have you received from gamers playing War Thunder on the PS4 compared to PC? AT: We got tremendous feedback from PS4-players – a lot of them are new to this genre and free-2-play games as well, so this is a very new concept for them. A high-quality game that you can play for free for as long as you want, which updates on a monthly basis, just blows the mind of many PS4-users. AS: Any new announcements that you would like to clue us in on? AT: Expect to hear more about US tanks very soon! Thank you, Alex, for providing us with a little more insight into the game and its future. We look forward to gathering even more information in the days to come as we continue to enjoy soaring across the skies in War Thunder. For our readers: Remember, if you would like to learn more and have questions of your own, please submit them to the Saitek Facebook or Twitter pages and I’ll make sure to get them answered. Until then, it’s time to head back to the skies! For more from Andrew follow him on Twitter, Instagram, Twitch, and Steam. Discuss this article on Facebook. Star Citizen Hardware Announced At Gamescom 2015! FARM SIM: Hands-on Demo at Gamescom 2015!